How can I combine data from multiple data folders in one query? - Event 1 Software, Inc.
How can I combine data from multiple data folders in one query? 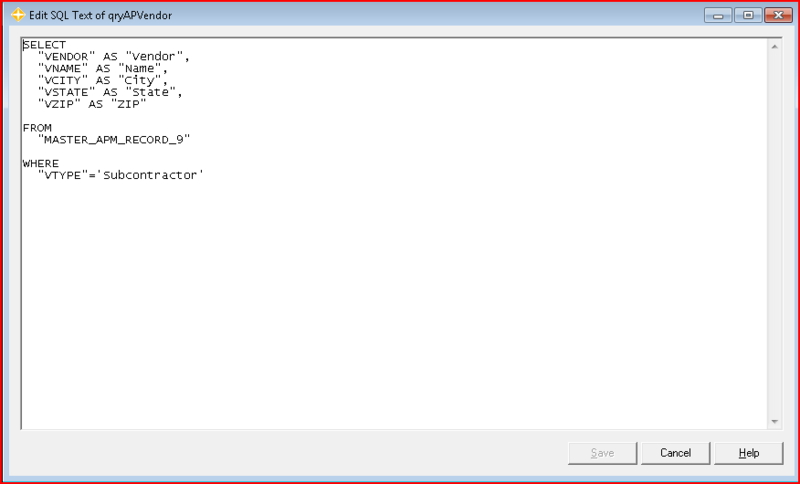 An ordinary query inserted into a worksheet using Office Connector only queries data from a single Sage 300 Construction and Real Estate data folder. By editing the SQL text of the query afterword, you can include the data from the same tables in other data folders. The solution is create a UNION query. This is essentially like having multiple queries that are combined together so that their results are stacked one on top of the other. To start the process, you can use the query wizard within Office Connector to create a single-folder query. This will act as the template for the other queries that will be added and stacked on top of each other. Insert your query using the Office Connector wizard. For example, let's assume you selected the AP Vendor table, clicked the Vendor, Name, City, State and Zip columns and then added conditions to only include vendors where the Type is Subcontractor. The table name of the query is shown following the FROM keyword. In this case, the table name is "MASTER_APM_RECORD_9" which is the internal name for the AP Vendor table. Type a simpler alternate name immediately following the table name as shown here. This name is called the table-alias. Click OK in the SQL Editor window and confirm that the query still refreshes normally. Transform into a multi-folder query. Select a cell inside the range containing the returned data and click SQL Editor on the Office Connector toolbar. Select all of the SQL text shown in the window and press Ctrl+C to copy it to the clipboard. Place your cursor on a new line at the end of the SQL text (with no text selected). Place your cursor on a new line at the end of the SQL text and press Ctrl+V to paste a copy of the SQL text. In the newly pasted SQL text, replace each occurrence of the original table-alias with a new one as shown here. Add the path of the new data folder just before the table name as shown here. Click OK in the SQL Editor window and confirm that the query still refreshes normally and now returns data from both data folders. Repeat step 3 for each additional data folder you wish to include. To eliminate identical rows that may appear if the same data is in two or more different data folders, don't include the word "ALL" after the word "UNION". Previous How do I create a list of field names in Excel?